Manatacut - Shinnecock Sachem was another of the important Shinnecock leaders during the 1640 settlement of the Town of Southampton. He also affixed his mark on the founding deed of that settlement. Here he is shown with wampum shell jewelry, tattoos for clan symbols, a fur robe and deer hair roach headdress with eagle plumes. 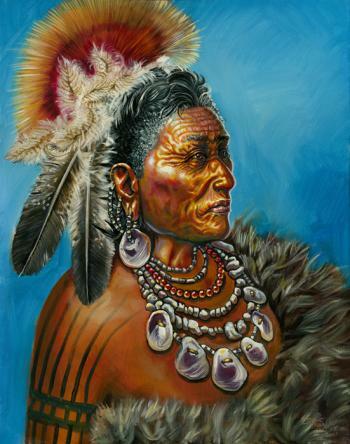 The sides of his hair is trimmed except for the top as was another Native American custom of the period. (The original of this image is an acrylic on canvas, unframed, $3000 plus shipping charges. For more information contact the artist.